AC power systems are becoming more popular on modern aircraft. Light aircraft tend to operate most electrical systems using DC, therefore the DC battery can easily act as a backup power source. Some modern light aircraft also employ a small AC system. In this case, the light aircraft probably uses an AC inverter to produce the AC needed for this system. Inverters are commonly used when only a small amount of AC is required for certain systems. 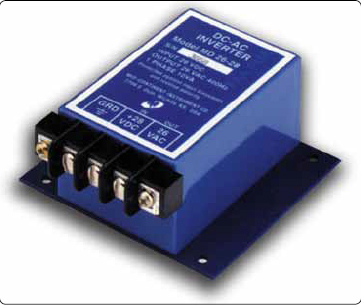 Inverters may also be used as a backup AC power source on aircraft that employ an AC alternator. Figure 1 shows a typical inverter that might be found on modern aircraft. A modern inverter is a solid-state device that converts DC power into AC power. The electronic circuitry within an inverter is quite complex; however, for an aircraft technician’s purposes, the inverter is simply a device that uses DC power, then feeds power to an AC distribution bus. Many inverters supply both 26-volt AC, as well as 115-volt AC. 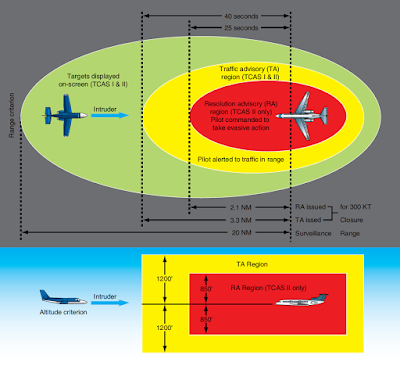 The aircraft can be designed to use either voltage or both simultaneously. If both voltages are used, the power must be distributed on separate 26-and 115-volt AC busses. AC alternators are found only on aircraft that use a large amount of electrical power. Virtually all transport category aircraft, such as the Boeing 757 or the Airbus A-380, employ one AC alternator driven by each engine. These aircraft also have an auxiliary AC alternator driven by the auxiliary power unit. In most cases, transport category aircraft also have at least one more AC backup power source, such as an AC inverter or a small AC alternator driven by a ram-air turbine (RAT). AC alternators produce a three-phase AC output. For each revolution of the alternator, the unit produces three separate voltages. The sine waves for these voltages are separated by 120°. [Figure 2] This wave pattern is similar to those produced internally by a DC alternator; however, in this case, the AC alternator does not rectify the voltage and the output of the unit is AC. The modern AC alternator does not utilize brushes or slip rings and is often referred to as a brushless AC alternator. This brushless design is extremely reliable and requires very little maintenance. In a brushless alternator, energy to or from the alternator’s rotor is transferred using magnetic energy. In other words, energy from the stator to the rotor is transferred using magnetic flux energy and the process of electromagnetic induction. 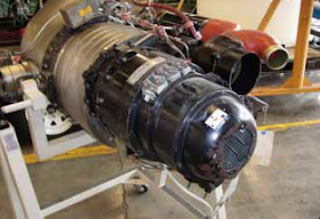 A typical large aircraft AC alternator is shown in Figure 3. 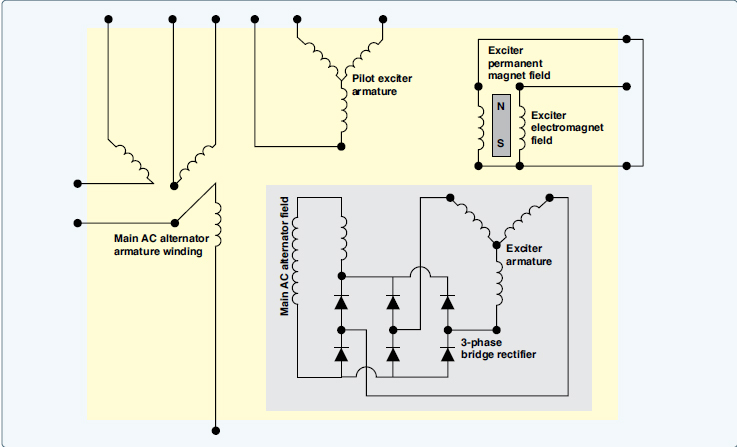 As seen in Figure 4, the brushless alternator actually contains three generators: the Exciter generator (armature and permanent magnet field), the Pilot exciter generator (armature and fields windings), and the main AC alternator (armature winding and field windings. The need for brushes is eliminated by using a combination of these three distinct generators. The exciter is a small AC generator with a stationary field made of a permanent magnet and two electromagnets. The exciter armature is three phase and mounted on the rotor shaft. The exciter armature output is rectified and sent to the pilot exciter field and the main generator field. The pilot exciter field is mounted on the rotor shaft and is connected in series with the main generator field. The pilot exciter armature is mounted on the stationary part of the assembly. 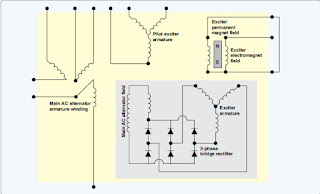 The AC output of the pilot exciter armature is supplied to the generator control circuitry where it is rectified, regulated, and then sent to the exciter field windings. The current sent to the exciter field provides the voltage regulation for the main AC alternator. If greater AC alternator output is needed, there is more current sent to the exciter field and vice versa. In short, the exciter permanent magnet and armature starts the generation process, and the output of the exciter armature is rectified and sent to the pilot exciter field. The pilot exciter field creates a magnetic field and induces power in the pilot exciter armature through electromagnetic induction. The output of the pilot exciter armature is sent to the main alternator control unit and then sent back to the exciter field. As the rotor continues to turn, the main AC alternator field generates power into the main AC alternator armature, also using electromagnetic induction. The output of the main AC armature is three-phase AC and used to power the various electrical loads. Some alternators are cooled by circulating oil through the internal components of the alternator. The oil used for cooling is supplied from the constant speed drive assembly and often cooled by an external oil cooler assembly. Located in the flange connecting the generator and drive assemblies, ports make oil flow between the constant speed drive and the generator possible. This oil level is critical and typically checked on a routine basis.